Calvin, Look Out! A Bookworm Birdie Gets Glass vs Online Dating Sites | What is ML Reading? If you’ve read my blog consistently, you know I’m a single mom. It’s been 10 years since I’ve been on a date. Based on feedback from others, the best way to meet someone is through an online dating site. I’ll get to that soon, but first I want to tell you about one of my favorite books of the year. Believe it or not this all works into what I think is a cohesive essay. When I saw the title Calvin, Look Out! A Bookworm Birdie Gets Glasses by Jennifer Berne and illustrated by Keith Bendis, I immediately knew ML would love it. Her friend she met when she was two is named Calvin. For a bit in preschool they agreed they would marry each other. Based on what I’ve seen online, I’m going to hold her to marrying Calvin. In the book, Calvin the bookwormish bird visits the library. All the books are blurry. He mistakes a chicken for a yellow dinosaur. The librarian recommends a visit to the eye doctor, Dr. Seewell. Calvin’s excited about his spectacles “as he preferred to call them.” Back at the tree, the others birds laughed at him, but Calvin didn’t let it bother him too much. Instead, he took a nature walk and enjoyed viewing all the things he couldn’t see before. Suddenly, he trips in the forest into a perilous situation. His glasses save the day. Now for the online dating bit. It appears bookworms who like to garden, wear glasses, and are single moms in their forties aren’t in high demand. The men in their forties state on their profile they are looking for women 35-whatever age they are. But I’m pretty certain they aren’t paying any attention to the women in their forties. Instead, they are trying to make themselves look less discriminatory. The ones in their fifties aren’t interested in single moms in their forties. They’ve raised their kids and are ready to travel the world. Why can’t Calvin the bird be a man in his forties? We have so much in common. We both love books, nature and wear glasses. It’s sad when you’re more interested in a bird in a children’s book than the thousands of profiles out there. Lots of men post pictures of themselves with dead fish. Many men put their favorite sports team as part of their user id. No one can possibly do all the things they say they do in a years time unless they are independently wealthy and don’t have a job. The percentage of single men in their forties and fifties claiming to do triathlons is much greater online than in the real world. With user names like Scarface, Justtooling, TheMidniteThud, native_fishr, (yes he has pictures with a fish) showing interest in you, it’s a hard choice. And many I can’t bring myself to even type. Should I spend my limited time writing about children’s books or trying the dating thing? I’m thinking books. But I’ll keep my online account for comic relief. 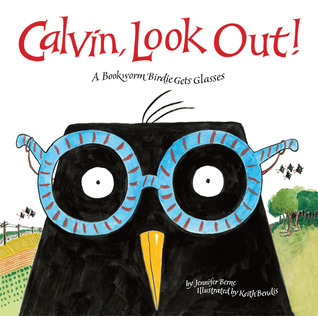 This entry was posted in Picture Book and tagged Calvin Look Out a Bookworm Birdies Gets Glasses, Jennifer Berne, Keith Bendis by mlreads. Bookmark the permalink.